This is a YMMV promotion for Amazon Prime members. The offers you see may be different when you are logged on to your Amazon account versus checking without being logged on. The offer is this: if you apply and get approved for an Amazon Store Credit Card (not to be confused with the Chase VISA credit card), you may be instantly upgraded to an Amazon Prime Store Card which earns you a 5% statement credit on your Amazon purchases paid with this Store credit card. Note that the 5% is mutually exclusive with the promotional financing offers. You either get the special financing terms or the 5% statement credits, but not both. You can change the setting per purchase and also change the default on your account, so be sure to find these settings in your Amazon account before making a purchase. 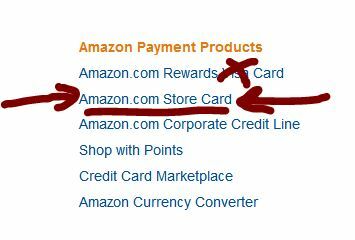 Depending on the promotion, you may also receive a bonus Amazon.com Gift Card loaded on your Amazon.com account. The amount varies depending on the promotion and whatever other factors Amazon uses to decide these things.